Most of us also love guns, and we like modding them into everything, from Minecraft to Kirby. [/size]You know what i also like? When guns in fantasy have cons and pros, so that their coolness factor isn’t the only thing holding them. With all of that said, i wanted the full gunslinger experience in our good old sandbox adventure game Skyrim. When you search for “Skyrim gun mod”, you will most likely endup on the page for Loshirai14’s Skyrevolution or Ghosu’s Project Flintlock. The thing is, Skyrim is many ways dumb as it is smart, and definitely one of the dumbest things in the way skyrim works is how you cannot add weapon or ammo types without some dodgy scripting. So all of these gun mods just kinda add some very well modeled boomgoing crossbows… oh well. 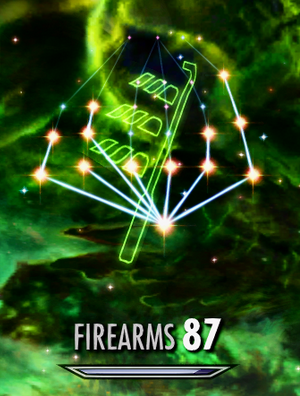 Then i found DavidTheFalcon’s SCS Firearms mod, and wow was it good, featuring a fully made firearms skill tree with all the nice perks and stuff. Initially i just wanted the Renascence firearms which in SCS are straight from Ghosu’s now opensource Project Flintlock, but then i decided to finally give both Mathy’s Dwarven Rifle Second Generation and Skyrevolution a shot considering David had SCS patches for both, making them work with his custom skill tree. Now they work well enough, but when i first grabbed the dwemer tech perk i noticed a giant issue. Litteraly all the dwemer guns had the same exact cost of 2 little dwemer ingots, even the crazy overpowered Aetherium rifles, so that was a major letdown, not that i blame David because well he didn’t even have to make the patches, but still i decided to take matters into my own hands and fix the recipes myself. Then i found that Loshirai14 had also made a dwemer AWP mod, so… i added support for it in my plugin, then i saw how it was a little dumb that you could unlock all the weapon types at once but you needed perks for the Blunderbuss and Grenade Launcher…. then i ended up making 9 perks, completely rearrenging the tree renamed every single weapon and added support for a whole new mod……. yeah i basically made myself a thing that had taken me 3 days of CK headache, TES5Edit manual fixing and lots and lots of CK weirdness, but it worked out in the end. So i am happy to present! First things first, with the exception of the archery tree, the weapon skill trees all have a system of 3 weapon type paths, you have longsword, mace and axe for onehanded and the other two handed stuff, well you know Skyrim is dumb you cant add new types but here is a workaround anyways. So SCS has a nifty system for tagging weapon types and ammo types and a nifty way to detect them, so based on that i developed three paths for the Firearms tree. You like to get up close to your enemies and blow them to bits, this path has you crafting weapons that cannot shoot very far, but surely go boom. Unchanged really, but in case you don’t know what it is, its a pipe that shoots bits of stuff at people, and that hurts a lot. Used to be called Grenade Launcher, but i decided to apply the cooler historical name, stats have not been changed. Used to be Skyrev’s Double Action Shotgun, but i heavily tweaked it, for one its not automatic anymore, but it dishes out a lot more damage and is supposed to shoot twice at a time(Not working yet), this one will replace the Blunderbuss once you level up. Not much changed besides the name, you can still use any rifle ammo on it, I’m trying to get a new weapon type for it, but for now just try to stick to not doing that k thenks. The name is a reference to Critical Roll, this one was Mathy’s grenade launcher, but i changed it to hell so its now actually worth something rather than just being fancy, this one will replace the Hand Mortar once you level up. You are sneaky and you like shooting things from far away, this path has you crafting weapons that shoot very far, but have slow reloads. Not that more powerful than the flintlock rifle but a lot more accurate, this is an edited version of Mathy’s single shot sniper rifle. Now this is where it starts, this is a renamed version of Skyrev’s sniper rifle, its very powerful, but slow. Not as powerful, but it is semiauto, has 5 shots before you reload, not as accurate or powerful as the basic Longshot, but i guess it gives you a close quarters weapon thats better than a sword or the flintlock pistol. Its the AWP, enough said. A silenced version of the AWP, does a ton less damage but doesn’t take away your stealth, no you cant change back! So if you want to use both versions you need to craft both versions! And thats final! This path has you just not really wanting to use much than your primary weapon and just consecutively making it better, or sticking to the design you like the most, either way you will go from bayoneted Flintlocks, to Gatling guns here. All of the semi autos in Mathy’s mod, unchanged, just renamed and with their descriptions re-added in. All of the automatics from Skyrev and DWRSP, minus the gatling guns. Well, i didn’t want to just disable them, so to get them you need to complete all the firearm paths and have a skill of 100(which you will by that point) then you can take the Aetherium perk, after that if you have completed the Lost to the Ages quest you can just head back to the forge and you can craft them there, if you haven’t well do that quest. The Aetherium rifles and the Lasergun can be crafted at the forge itself, they do take quite a hefty amount of resources tho. -Dwemer ammo has been moved to the bulletcraft path. -Some Perks had their descriptions altered. 1 – MAKE SURE YOU ARE USING THE >>>>>MERGED THIEVERY<<<<<[/url] VERSION OF SCS, I DON’T CURRENTLY SUPPORT ANY OF THE OTHER VERSIONS. 2 – MAKE SURE TO INSTALL LOSHI’S AWP MOD FROM HERE[/url] IT HAS TO BE ENABLED! 3 – Install SCS and all of its patches. 4 – Install my mod using a mod manager, or just drop it in the data folder, its a single file no hassle mod. Optional: If you use CCOR i advise also getting one of my Charcoal Stick recipe plugins. 6 – Make a TES5Edit Merged Patch. 7 – Make a Bashed Patch. Optional: You can install this on an existing save that has SCS Firearms running, but i heavily advise against uninstalling this mid playthrough. 4 – Find my mod (SCS-Firearms_dwrpsandkce_recipes.esp) on your list, tip its the same as the load order shown in wrye bash. -Mathy’s guns don’t seem to play the reload animation, not sure whats up, they still act as if the animation is being played tho. -Sometimes Mathy’s guns don’t play any sounds when fired, saving and reloading seems to fix it. Skyrim weirdness i guess. -The Pumpgun refuses to fire twice, so for now it just fires once then you have to reload. -Add support for more mods(If i find them and they are good). -Add some effects to the perks or some effect perks. -Potentially add my own weapons, we’ll see I’m still a noob to Skyrim modding. -SE Port, soon as skill trees stop exploding in CK64. -Add some more weapon type checks, especially for the flamethrower and starlightshot guns. Loshirai14 for the AWP and the Skyrevolution mods. https://www.nexusmods.com/skyrim/mods/60292/ and https://www.nexusmods.com/skyrim/mods/26605/? Mathy for the Dwarven Rifle Second Generation mod. https://www.nexusmods.com/skyrim/mods/54498/?